A Eurasian species, much less commonly escaped in this region than some of its relatives. Forests and thickets; swamps. First collected in 1932 in Berrien Co. The corolla is yellowish white or white turning to yellow the second day. Hybrids may be expected, with very short-stalked glands on ovaries and other parts as a clue for recognizing involvement of this parent; a Berrien Co. specimen appears to be the hybrid with L. tatarica (L. ×xylosteoides Tausch.) Some material with obovate blades and glandular bracteoles may also be L. ×minutiflora (L. morrowii × L. ×xylosteoides). MICHIGAN FLORA ONLINE. A. A. Reznicek, E. G. Voss, & B. S. Walters. February 2011. University of Michigan. Web. 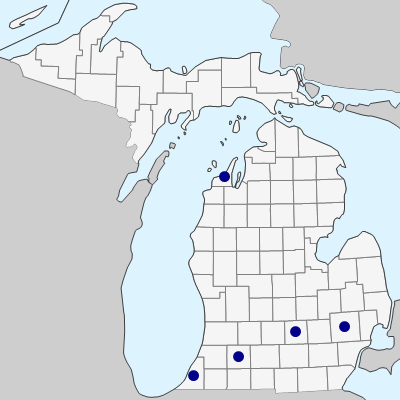 April 22, 2019. https://michiganflora.net/species.aspx?id=730.